Tom Clark @ Pulse Radio Present… Tom Clark @ Kink – Nevermind : 01.11.2008 : Photo by FriniK from ITM. 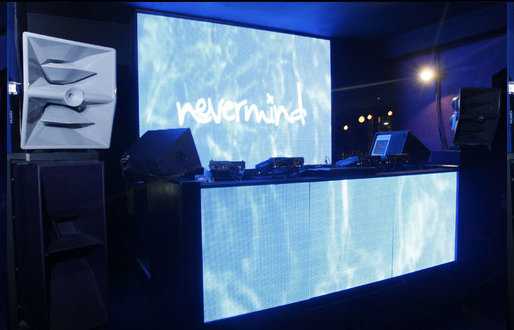 Nevermind is a newly renovated club at 163-169 Oxford Street, in Darlinghurst. There have been a lot of different and separate clubs (and club-nights) upstairs at this spot on Oxford Street over the years; ‘Suzie Q’s’, ‘Havana Club De Luxe’, ‘Mylk Lounge’, ‘Tantra Bar’, ‘Byblos’, and many more. I think this might even have been where the old ‘Zoom’ was in the early 1990’s. Before my time in Sydney, but I have friends who went, shouts to Justin and Murray. I think 2005 was the last time I went to this venue, it was Suzie Q’s at the time, and I saw The Hacker [Live] & David Carretta [Live] who were both excellent. 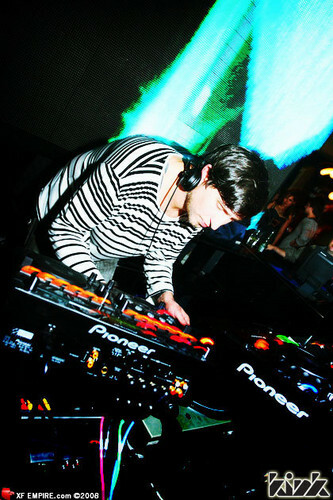 I also remember seeing James Holden at a Sweet Chilli night there a couple of months earlier, sneaking away from a Chris Liebing party at the Gaelic Club the same night, that was a musical contrast! Liked James Holden’s sounds better. So, back to Tom Clark @ Kink. This night was co-presented by Internet radio station Pulse Radio. Pulseradio (as it used to be) has some history in this same venue, it’s where their launch party was held, back in 2000, the club was called Tantra at the time. I performed live as TECHiONE that night (photo at bottom of this page). That party was a huge success, the venue reached capacity at 11pm, with a long line of people still wanting to get in left outside. Times have changed huh! I had weekly DJ radio shows on Pulseradio from 2000-2007. It’s under new management now. So, Nevermind… I was really impressed with how the club is set out and set up. It looks great, feels comfortable. Check out these photos of the renovation work, and how it turned out when completed. Some interesting artwork around the place. A good sized dance-floor space, nice bars, friendly staff. A++ would visit again for sure. Minimal lighting, but not much needed with the excellent visuals/graphics they have setup in front of, and behind the DJ booth. Finally a club in Sydney, Australia catches up to the ubercoolische looking DJ booths in clubs and at parties in Europe. I imagine it’s a mesh/screen of 1000’s of small red, green, blue LEDs interfaced to a computer, emulating dots on a TV. It’s very impressive, very bright too! It would look even better if they kept those Oxford Street light blocking curtains behind the DJ booth area closed. I mention this because it distracted me. VJ Morph was doing a great job with visuals. You can see the visuals/graphics in action at Nevermind in these YouTube clips below. Probably best not to take too much notice of the music in these clips. Can’t people clap in time with the music anymore? So, how’s it sound? They have a Funktion-One sound system, with some satellite speakers around the venue. It’s decent, loud and clear, but not very bass heavy I thought. Not like the massive bass the Funktion-One system had at Mad Racket last time. Actually the volume and bass levels seemed to be up/down the whole night at Nevermind. I’m not sure if that was DJ mixer error, or lack of audio processing, compression/tuning etc. I’m sure they are still working the bugs out of the system, being a new club etc., but it has potential to be awesome. We got treated to some horrible audio feedback when Tom Clark first started up, using vinyl records, unable to bring the volume level up. It sounded like the turntable needles were feeding back through the system/monitors. I wonder, with the amount of DJs using CDs now in Sydney, it’s quite possible the system was setup and tuned with CDs, and never had vinyl run through it before, I wouldn’t think so, but that’s what it sounded like. Anyway, a laptop was quickly setup, guessing either his or someone else’s Serato/Final/Traktor-Scratch system, the sound/volume was restored, and Tom got things under way. As far as music… Tom Clark played a lot more darker, tougher, colder sounds than I expected. With him coming out of Berlin’s summer I was perhaps expecting more musical, deep-house style minimal flavours, or maybe that’s just what I wanted to hear, that’s not really his sound though. I’ve seen Tom play in Sydney a few times now, every time he’s been out I think, right back to his first gig at Crunch. I didn’t know much of what he played on the night, but I liked it. It was fun to dance to, good, solid, minimal, techno/tech-house music. Unfortunately only about 30 people in the club felt the same and actually danced, which probably didn’t encourage him to set the floor on fire. A lot of it sounded like stuff that could be on his Highgrade label, although I didn’t recognise any tracks. I’m sure there was quite a bit of Format:B stuff played. There were no real stand-out moments for me though, where I had a burning desire to ask for track IDs, nothing that memorable. He finished up 30 minutes earlier than his 3 hour set time. I hope his set after at Spice was more appreciated. The young/new-to-clubbing (I felt old here) ‘trendy’ crowd (see here) that were the majority of the 100-200 people there earlier didn’t seem very interested in the sounds/music, or in being in the club for very long, short attention spans? lack of patience? Probably not happy with the lack of MOS style sounds. The place was pretty much empty by 2.30am just as Tom Clark finished up. I’ve never seen a club empty out like that before, it was quite strange to witness. I think it’s going to be a real challenge to get an older or music loving/focused crowd back to an Oxford Street club, and to change people’s perception of the Kink brand/sound. I was never a fan of Kink before (I doubt I would have got let into the Arthouse), but I like where they are going with their sound/style now. I’ve heard rumours of some good minimal/techno internationals coming up. I hope Nevermind succeeds, it just needs to find a good supportive crowd. A lot of thought, time, money and passion has gone into putting this club together, and that deserves to be supported. I look forward to my next visit to Nevermind. I just wish it wasn’t on Oxford Street, Darlinghurst. It’s a scary place to be out at night on the w/ends now, such an aggressive, ugly vibe. There are packs of ethnic, roided up guys walking around seemingly just looking for, or to cause, trouble! It’s not good. This used to be the funky, trendy, gay friendly ‘place to be’ in Sydney back in the day. It’s sad what it has become now. What happened? Why is there so much violence around now? This happened just up the road, about 30 minutes after getting into the club, I’m glad I missed it!